Being a dentist means that we see all kinds of patients. Very often, patients want to know if there are things they can do in the course of their regular routine to make sure their teeth are in optimum oral health. 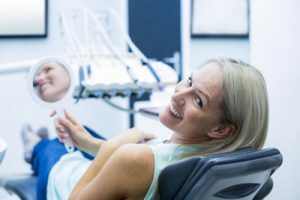 While we know there is no magic way to make sure you do not have problems, we also know there are certain things you can do on a regular basis that will prevent you from needing excessive dental work. Most of these things we will routinely discuss in detail when you come into our office for an exam. At-home dental care is just as important as regular dental visits. These include things like brushing your teeth at least twice a day for a minimum of two minutes, visiting our dentist office biannually, and using floss to clean the areas where a toothbrush cannot reach. If you start to do these things on a regular basis, you will get in the habit of thinking about your teeth, and this will make it easier to follow some of the other advice you may receive. As a dentist, one of the largest problems we see with teeth and oral health, in general, comes from the vast overuse of sugary products that cause an immense amount of damage to your teeth. You may already know this, but sugars help foster the growth of bacteria that normally occurs in the mouth, and this, in turn, works to increase problems like cavities and other issues like gum disease if not properly addressed. What you may not know is that as bad as sugar is, sour or acid is just as bad, if not worse. Acids in products like the ever-popular sour gummy bears attach themselves to the teeth, where will they work with the acids already present in the bacteria to break down the tooth enamel, and this often leads to more cavities. With the increased popularity of sour and sugary treats, we have also seen an increase in the number of cavities in people who consume them on a regular basis. While this may come as no surprise, it's important to change your toothbrush a minimum of two times each year. This means if your toothbrush is anywhere over six months old, it is time to throw it away and replace with new one. For people who use electric brushes, this means replacing your toothbrush head at least every six months. If you are already a patient of our office, you know when you come in for your regular six-month visit, we will give you a new toothbrush. This is to serve as a reminder that it's time to replace your toothbrush or toothbrush head. Included in your little care package when you leave our office is also a box of floss. This serves as a reminder that you need to floss your teeth a minimum of once a day so you are cleaning those hard-to-reach areas that your toothbrush cannot get to easily. Request an appointment in our Kirkland dentist office here: https://www.kirklanddentalexcellence.com. « When Are Caps For Teeth Recommended?